To learn about new horse-related blogs (broadly defined to include donkeys, mules, farm life, land use, other topics vaguely horse-related). To share ideas for contests, topics, content, advertising (if that's your bag), etc. 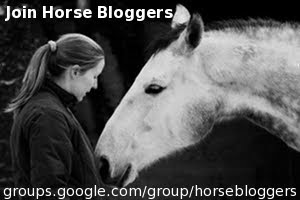 Sixteen horse bloggers have already joined, and I've created a page 'o badges as well as helping two bloggers create their own promotional badge. Why aren't you clicking on the link to join, already? I don't wanna inundated with mail! Google let's you turn off email (read posts only when you go to the web site) or receive messages in one daily digest. I'm not a serious/ambitious blogger. This group is for folks who do it for fun or for profit, who blog daily or occasionally, who are technically experienced or not, and in any discipline or focus -- for anyone, really. I don't see how it will benefit me or my readers. Well, for one thing, if you join and provide a badge I'll feature your badge on top of my blog for a week. How's that? I like to maintain anonymity. All you need to provide is an email and your blog. I'm anti-social and don't join groups. Oh. Okay. Your link on the featured blog leads to a blog that doesn't exist. For what it's worth, I've been running http://horsebloggers.com for two years now, and it has about 240 horse-related blogs listed. This is not a corporate directory; I am just another blogger who likes to build sites. I'm not saying that my site is or should be the one-and-only such resource, but since I don't really do promotion and much prefer to just build, I'm not sure that people are 1) aware the site exists, or 2) aware of how willing I am to build it out in ways that will really make it an effective community resource for horse bloggers. 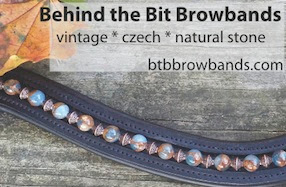 I've always thought Horse Bloggers could be much more than it is, and if there's interest in really developing a great community resources, I'd be happy to pow-wow with people and see what can be done. I'm definitely intending to get involved. Been gone at the HT this weekend, I'll make myself a badge and explore the group a little more once I have gotten caught up on everything else. Hi Halt Near X, I've belonged to your horsebloggers site since I've been blogging -- it's a great resource discovery tool. I reviewed it again before creating the group and I didn't see a good way for bloggers to talk to each other (am I missing something). I'm interested in coordinating / integrating in any way that makes it easier for folks to communicate. It makes sense to build on the site you have it the functionality is there. How hard would it be to add a forum component or to integrate google groups? Stacey, you're right that right now it's not really more than a directory and there aren't a lot of community features. A forum is certainly possible. I have some other things in mind as well. Let me pull some information together and I'll put a post on the Google Group so anyone who is interested can chime in and the discussion doesn't take over your comments here. Hey, comments are All Good! Feel free to post here or to the Google group, whichever makes the most sense. I love your horse bloggers site and adding the forum would be the ideal situation I think. Something more like Barnmice perhaps? I would love to do it, but honestly may not get a badge out there. I'm not hopeless, but my computer is. So, I will bow out for now I suppose. Good luck, it sounds GREAT! I'm game :o) Anonymous up there is right, I clicked on the featured blog yesterday and it said the blog does not exist (forgot to pass the word, though). I joined but don't know how to make a badge. woohooo sign me up! Well I will sign myself up... I am definitely one of the people that will need help making a badge though. Thanks for the info as always! *Laugh* I did? Really?? Well a yay for me, and a thanks for you :o) Just posted my info on your "Page o' badges" thread BTW. How do I add my badge? I joined and think it's a great idea. The horse bloggers site looks great too so if there is a way to create some communication platform there I think it would ba fab. Great idea! I'm happy to be apart of the group. Would love to be part of any group that you form. I run the www.riders4helmets.com website blog (homepage of the website). Regards, Lyndsey. You have a great blog by the way!!! FWIW I much perfer a google group over a forum type interaction. I like the idea of a google group and going over to join right now. I probably would not bother or be as active on a forum. IMO - a forum is a good way for people to look up things like directories, while a google group is a better networking tool within a group of people - ie a google gropu will be more useful for horse bloggers to interact with other horse bloggers, get ideas, etc. Stacey, I'd love to join! Is that ok? But, duh, what's a badge?